(AINA) -- The uprising of the Egyptian Youth, both Copts and Muslims, has been dubbed as the "Facebook Uprising" mainly because it was started by modern and educated youth who depended on the social network "Facebook" and "Twitter" to organize themselves. Until now it appears that they are nondenominational, do not belong to any political party and without a leader, demanding the "ousting of the present corrupt regime and the octogenarian President Mubarak, to make way for a democratic and secular Egypt, with social justice and equality for all Egyptians. The uprising which is now called "January 25th Youth Movement" has gained support from Egyptians of all walks of life. Several Coptic organizations have been taking part in the demonstrations, believing that change in Egypt is coming and they have to be there. They perceive their participation will put weight and balance the scales for a secular state. Activist Rami Kamel, one of those responsible for the Coptic Youth Movement, said thousands of its members participated in all protests and in all areas, including the "Day of Departure" demonstrations on February 4, which called for the immediate ousting of Mubarak, and confirmed their intention to do so, until all demands of protesters are met. He added they joined the demonstrations the first day. "We have to get rid of the President, and his regime, which was the cause of the decline of Egypt economically, socially, and caused all the sectarian problems suffered by the Copts." After President Mubarak bowed to international pressure and the ongoing daily protests asking for his departure, he declared that he would not seek reelection but would finish his current term. Mubarak appointed a vice-president and brought in a new government which called on all parties to join in a dialogue for the future. All parties have been invited to take part in this dialogue except for the Copts. This has angered Copts world-wide, especially since they believe their January demonstrations all over Egypt after the bombing of the Two Saints Church in Alexandria on New Year's Eve (AINA 1-2-2011) was the spark that ignited the present uprising "by breaking down the barrier of fear." This view is also held by the Coptic Church, whose Bishop Anba Suriel of Melbourne told "The Australian" on February 5 that "he believes the nascent revolution began with the New Year massacre of 23 Copts." For his part, Coptic Dr. Naguib Gabriel, head of the Egyptian Federation of Human Rights Organization, addressed Major Omar Suleiman, Vice-President of the Republic, urging him to include the Copts in the dialogue with the national authorities, initiated by the Vice President on Wednesday, on grounds that the Copts are part of the national community, and must participate in decision-making, particularly in the constitutional committee. Gabriel stressed in his message to the Vice-President, which was aired on some TV channels this morning, that it is not possible under any circumstances to exclude Copts from the national dialog. He pointed out that many Coptic youth were killed and wounded since the beginning of the January 25th Youth Movement, demanding with their compatriots constitutional, legislative and social reforms. He wondered how could the Muslim Brotherhood can be invited for dialogue and not the Copts, who comprise 15-20% of Egypt's population. It was reported today that Islamist groups have asked Major Omar Suleiman to be included in the dialogue. Rami Kamel told the Egyptian daily el Masry elYom the Coptic Youth Movement has legitimate demands consistent with those of the rest of the demonstrators, pointing out the regime has ruled out Coptic activists from the dialogue with the political authorities, which confirms the marginalization of the Copts. Coptic Pope Shenouda III said on Egyptian state TV two years ago that the number of Copts in Egypt exceed 12 million. "This is based on baptisms and marriages in addition to lists of families in the church registers all over Egypt," said Father Antonius Isaac of St. Mary's Church in the Mohandeseen area of Cairo. "This number does not include Copts in small villages and hamlets who have no church and have never seen a priest, due to the government policies of limiting church building." The main Coptic demands are a new secular and democratic constitution without the second Article of the present Egyptian Constitution, which states that Islamic Sharia is the source of legislation, and which makes them second class citizens. "We are at least 15-20% of the Egyptian population and we demand proportionate representation and definitely no restrictions on church building," said activist Joseph Armanious. "We also demand what all other Egyptian protesters are asking for, but these demands come on top." The Coptic Church had called on its followers not to join in the protests, angering many Copts who decided not to follow the soft attitude of their church towards the regime, saying that it only has to limit itself to spiritual matters. Faced with the pressure of the defiant Coptic youth, the church was later forced to relax its stance and allowed Copts to join but only in "peaceful protests, in a civilized manner and within the law." Pope Shenouda gave his support for Mubarak at the beginning of the protests, which led many activists to accuse the church of believing Mubarak, "who managed to present himself to the Coptic Church and the Coptic people as the ultimate guardian of Copts in Egypt, despite this regime being responsible, first and foremost, of all sectarian terrorist incidents that took place against the Copts," says Coptic activist Fawzy Hermina. He added: "The scandal and the straw that broke the camel's back was what the British Embassy in Egypt said, that the Ministry of Interior is the organ which is responsible for planning and carrying out the bombing of the "Two Saints" Church in Alexandria on New Year's Eve, which killed thirty and wounded ninety Copts." Many Copts share this view, including Coptic political analyst and activist Magdy Khalil, who said "Mubarak has been involved one way or another in the Alexandria church bombing." 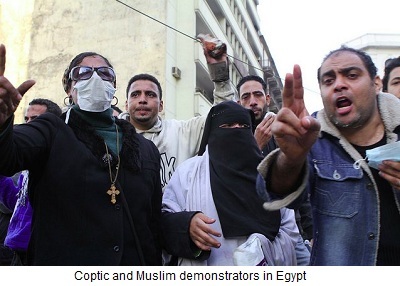 Reuters/Arabic carried out an interview with Coptic demonstrators in Tahrir Square, published on February 4. It reported that most of them said that they want to see Mubarak toppled and his regime gone "now more than ever." One Coptic dentist explained that the New Year's Eve Alexandria church bombing brought to an end the lie that the regime was protecting the Copts, and that was why the Copts went out demonstrating against Mubarak at the time, while another Copt who came from Nag Hammadi, where six Copts were shot by a Muslim on Christmas Eve 2010 (AINA 1-7-2010) said "We came here to show that every Egyptian should be here and want to be here, no difference between Christians and Muslims." Speaking about the fear of the Copts at the present moment, Coptic activist Wagih Yacoub said "Things are moving so fast and nobody knows what to expect next, everything is up in the air, however, Copts are desperate that an Islamic outcome should be avoided. We all say yes to change, but no to an Islamic state." Asked in a television interview with CNN on January 31, Coptic business Tycoon Naguib Saweiress, who has been appearing recently as a Coptic leader, praised the "Facebook Uprising" as he also called it, but cautioned that "one has to watch the Muslim Brotherhood of not hijacking this uprising." This view is shared by all Copts and Muslims who do not agree with Egypt becoming an "Islamic Caliphate."